NETWORK FINALS: ABC’s SUPER TUESDAY coverage gained 0.1 in final numbers, a bump the network probably would have preferred to receive on THE MUPPETS or AGENT CARTER (neither of which budged from morning numbers). NEW GIRL rose 0.1, and the WORLD DOG AWARDS lost the same. CABLE HIGHLIGHTS: New news took the edge from the older kind, as CNN and Fox News’s SUPER TUESDAY coverage grabbed a remarkable 8 of Tuesday’s Top 11 cable slots. As usual, CNN had the lead in 18-49s (peaking in the 9PM hour at 1.25), while Fox News took the older total viewers crown with 5.1M in the same hour. The more historical hit of the night was FX’s PEOPLE V. OJ SIMPSON, down 0.13 to 1.15. HGTV’s FIXER UPPER dropped 0.16 to 0.81. OWN’s THE HAVES AND HAVE NOTS slipped 0.04 to 0.75. On Bravo, REAL HOUSEWIVES OF BEVERLY HILLS fell 0.07 to 0.60, and was followed by the extremely low 0.11 premiere of TOUR GROUP. Discovery’s MOONSHINERS dropped 0.06 to 0.59. On Freeform, PRETTY LITTLE LIARS edged down 0.04 to 0.55, and SHADOWHUNTERS was steady at 0.37. A&E’s MARRIED AT FIRST SIGHT lost a tenth to 0.49, and FIT TO FAT TO FIT shed 0.04 to 0.26. 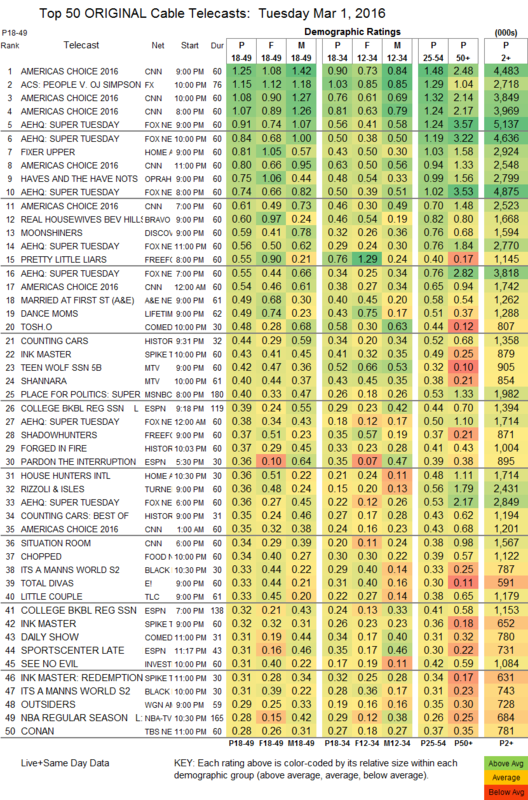 On Lifetime, DANCE MOMS dropped 0.02 to 0.49, and MOTHER/DAUGHTER EXPERIMENT premiered at 0.19. Comedy Central’s TOSH.0 dropped 0.02 to 0.48, and NOT SAFE WITH NIKKI GLASER was also down 0.02 to 0.27. History’s COUNTING CARS (airing after a clip show) gained 0.06 to 0.44, while FORGED IN FIRE lost 0.02 to 0.37. Spike’s INK MASTER returned with 2 episodes at at 0.32/0.43, with an INK MASTER: REDEMPTION show afterward at 0.31. On MTV, TEEN WOLF rose 0.06 to 0.42, and the season finale of THE SHANNARA CHRONICLES gained 0.07 to 0.40. TNT’s RIZZOLI & ISLES fell 0.07 to 0.36. BET’s IT’S A MANN’S WORLD rose to 0.33/0.31 from last week’s 0.23/0.26. On E!, TOTAL DIVAS dropped 0.05 to 0.33, and JUST JILLIAN lost 0.02 to 0.16. TLC’s THE LITTLE COUPLE was down 0.02 to 0.33, and RATTLED fell 0.05 to 0.23. WGNAmerica’s OUTSIDERS remained at 0.29. 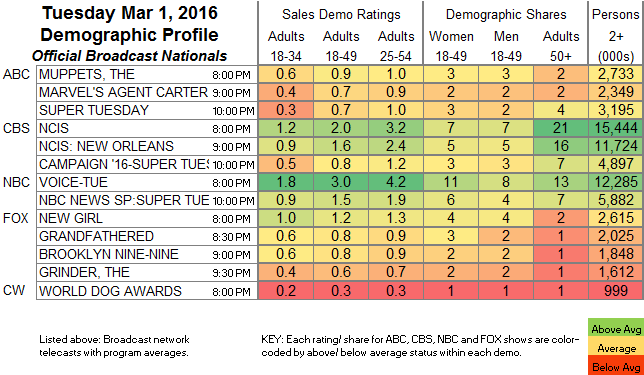 POP’s IMPACT WRESTLING rose 0.02 to 0.08, with the re-airing at 0.02/68K.